This simple 2 line warmup is a great team exercise! This 2 line warmup can also be used for conditioning your soccer players. This is a commonly used team warmup, and all teams should warm up as a unit, in a well organized fashion. - Players maintain a jog pace a few steps apart from player ahead of them. - The coach, or one player is in charge of leading this, calling out instructions. - Example: Jogging across sideline to sideline, captain leads the warm up. He/she calls out jump, right/left hand to the ground, and players respond in unison. Captain calls out back to front, and on "GO" back 2 players sprint to the front. - Back to front, back players sprint to the front. - Front to back, front players sprint forward 5 yards, then backwards to end of line. 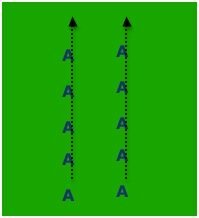 - Spread players 5 yards apart as they jog, and back player sprints weaving inbetween each player in his/her line until reaching the front, or front turns and weaves to back. - Side to side, players skip side step facing sideways, then flip. - Use this as a fitness drill towards end of a soccer practice, can extend to longer then 10 minutes for more fitness. - Any footwork/exercise you can try incorporating into this type of drill, experiment! - 7-10 minutes for this 2 line warm-up drill.